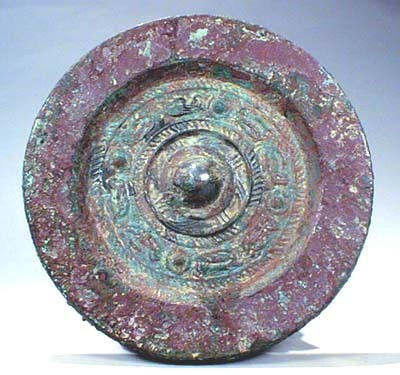 This is a small but heavy Han dynasty (206BC to 220AD) bronze mirror, with raised fine decoration around the central loop,the low hemispherical knop within a thread-like pattern of stylized animals separated by four bosses, a very similar design mirror was illustrated in sothebys catalogue-New York,March 22-23 1999,no 290. SIZE: 100mm (4 inches) diam. 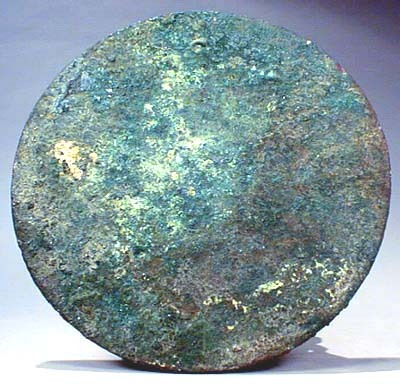 CONDITION: Moderate to heavy verdigris encrustation, partially cleaned. 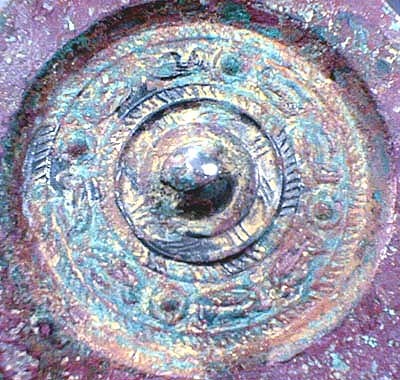 This pinkish-red colour to the bronze is often seen on the early pieces. Please call or e-mail for price.